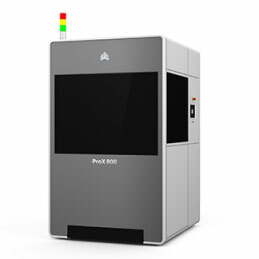 The new state-of-the-art ProX™ 800 is the most advanced plastic part 3D printing technology for printing the highest precision, highest resolution, lowest cost and highest volume output across the widest range of addressable applications for prototyping, direct and indirect manufacturing. The engineers at 3D Systems have implemented new laser print head and print material management systems to lower total cost of ownership for these workhorse printers. Through creative new architecture, the overall machine dimensions have been dramatically reduced, saving up to 50% floorspace without sacrificing print volume or maximum part size capabilities. Additional improvements boost printer utilization rates to new levels to maximize investment value. The ProX 800 is available immediately.